Meet your new, mysterious friend. He's 7 years old, 36cm tall and is described as a relatively easy-going, friendly character. 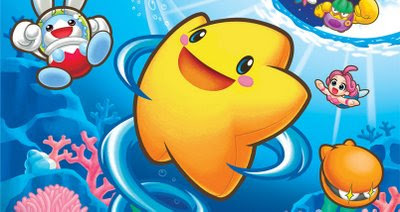 His name is Starfy and he's the star (no pun intended...well perhaps a smidgen) of Nintendo's long-time Japanese franchise The Legendary Starfy. This Mario/Kirby-inspired series made its debut back in 2000 when developer TOSE created a prototype for the Game Boy Color; however, this title was canceled due to the release of the Game Boy Advance. Seven years later, and four sequels later (in Japan), the franchise has finally arrived here in North America.